It is not very often I get to report I've discovered a new ski trail right in the Village of Lake Placid. But I have!!! There is a new trail system in town, inspired by and named after one of Lake Placid’s greatest benefactors, Henry Uihlein. Henry’s Woods, a 212-acre parcel of land accessed from Bear Cub Lane boasts a 2.5-mile loop that winds through the woods behind the Uihlein Mercy Center. The trail system was designed and engineered by a famous North Country Skier: Tony Goodwin, of Keene. 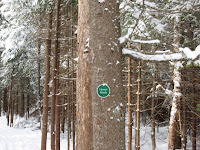 Goodwin is the director of the Adirondack Ski Touring Council and the Adirondack Trail Improvement Society. The loop starts with a minor climb regardless of how you choose to start. You reach the high point right around a mile, after which you'll enjoy a slight downhill, with the most challenging part a single “S” turn on both descents. A very important aspect of this new ski opportunity is the fact that it is pooch friendly. That is, you and your canine friends can enjoy skiing together without the worry of running into mean old New York State Forest Rangers or other ski trail police!